Goodness of fit procedures are essential tools for assessing model adequacy in statistics. 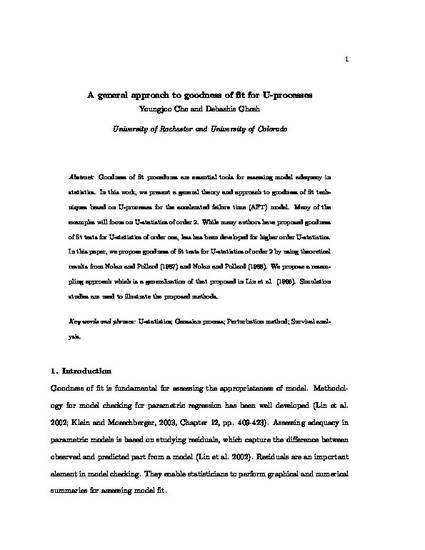 In this work, we present a general theory and approach to goodness of fit techniques based on U-processes for the accelerated failure time (AFT) model. Many of the examples will focus on U-statistics of order 2. While many authors have proposed goodness of fit tests for U-statistics of order one, less has been developed for higher order U-statistics. In this paper, we propose goodness of fit tests for U-statistics of order 2 by using theoretical results from Nolan and Pollard (1987) and Nolan and Pollard (1988). We propose a resampling approach which is a generalization of that proposed in Lin et al. (1996). Simulation studies are used to illustrate the proposed methods.